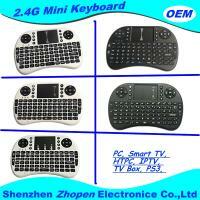 * A Perfect Keyboard for your Windows & Mac OS PC, HTPC, IPTV, Web TV, Google TV, Android TV Box, PS3 & Xbox 360 etc. 8. Build-in removable rechargable Li-ion battery that has longer standby time. 1. Operating range: 15 meters(MAX), without signal disturbance and no direction limit. for Xbox360, for PS3, HTPC/IPTV, etc.